There was a time when comedy wasn’t based on just innuendo and profanity. Laurel and Hardy became the biggest comedy stars of their generation with routines based largely on visual humour and exquisite timing. Set mostly in the UK in 1953, when the world’s once most famous comedy duo were trying to revive their careers with a theatre tour of their old material and futile attempts to get a film deal, Stan and Ollie is a charming, touching and extremely entertaining story of the end of an entertainment era and the buddy-come-love story of two men whose shared past is impossible for them to escape. Initially we are shown events at the peak of their success in 1937, when they were making Way Out West. Not only do we get an insight to the creation of their effortlessly brilliant visual humour, but we are also shown the marked difference in the two characters. 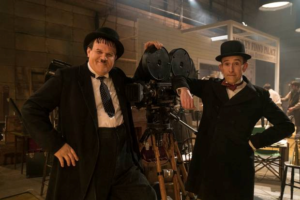 Stan Laurel (Steve Coogan) is a workaholic, driven creative comedy genius, keen to get a bigger share of the huge revenue their work generates for the studio system. Oliver Hardy (John C Reilly) on the other hand is much more interested in gambling and the high life, needing steady work to pay off two ex-wives and to be able to afford life with his new fiancée. With Laurel’s contract close to its end, he is keen that they find a new studio and better terms, but Hardy still has time left on his contract and is not keen to take the risk. The effect is to undermine their success and to leave them, 16 years later, searching for a way back. This film works well for two key reasons. The first is that it charts the decline of those who made the successful transition for vaudeville and silent films to modern cinema, but were left behind by changes in taste (there is a poignant reference to Abbott and Costello) and the growth of television. The meticulously reproduced routines, while performed now by old men, show how simple successful comedy can be. The other triumph is of course the performances of Reilly and Coogan. While Reilly gets some help from copious amounts of latex, both manage to imitate the duo to absolute perfection- from the dance routines through to mannerisms and voices. They show how Stan and Ollie never let their screen personas slip when in public, with every interaction an opportunity to slip in a routine. When the UK tour is floundering they need little encouragement to rescue it with public appearances that have the desired effect, and every re-enactment of their famous sketches leaves us wanting more. The performances go beyond just imitation, and both principals display their considerable acting talents, particularly in the scenes when the pair fall out and then have a painfully touching reconciliation. As with many a good story, there are some liberties with history. We are led to believe that the pair did little between 1937 and 1953, when in fact they made many films for a new studio up until 1945. We also see Laurel at odds with the producer Hal Roche, feeling that he has little control, when in fact he was a co-producer on Way Out West. Such issues are, however, of no significance in a story of a great and lasting friendship. When Hardy becomes ill and is advised not to perform, Laurel can’t make himself continue with anyone else, and after Hardy’s death he continued to write material for the two of them. This is a highly entertaining film that richly deserves its award nominations.